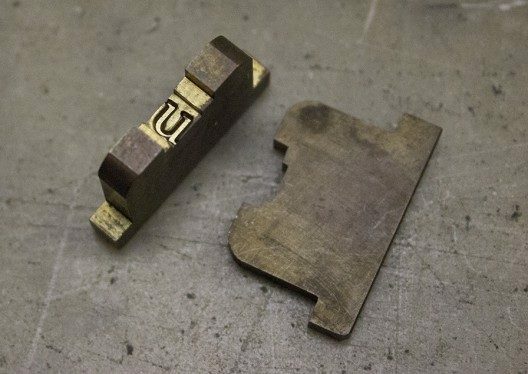 From Gutenberg’s invention of “movable type” in the 1400’s until the mid 1800’s, type founding remained essentially the same—type metal was poured by hand into a mould closed by a matrix. With the industrial revolution and the increase in literacy and the accompanying rise in the demand for printed material, inventors turned their attention to mechanizing type founding equipment. The first successful machines were designed for the companies engaged in selling type to printers. While these machines improved the speed of production and quality of foundry type, they changed nothing on the composing room floor—the process of setting and distributing type remained as labor intensive as it was in the 1400’s. Not surprisingly, the first commercially successful type composing machine, the Linotype, was sold not for the quality of its type, but for the labor savings it produced. To further discuss the Linotype and the other machines that followed it, some basic type founding terms and concepts are needed. Nearly all of the type casting equipment currently in use is made up of the same basic parts: a heated pot full of molten type metal that contains a pump, that when triggered, releases a plunger, that then forces the liquid type metal through a nozzle or mouthpiece, accelerating the type metal into a mould, which forms the body of the type or slug, that is capped by a matrix which forms the printing surface of the type or slug. While these parts are common to all machines, there is a tremendous variation in the exact geometry and engineering from machine to machine. Pots — can be heated by gas or electricity. Many, (Linotype, Intertype, Ludlow, and Thompson) have an integral pump body referred to as a well. Pump — one group of machines, those designed and built by the Monotype Corporation, utilized a free floating pump in the pot, which, while more complex, provided greater flexibility of output. Plunger — sized to fit the pump or well, its stroke determines the volume of type metal forced through the nozzle or mouthpiece. Typically spring driven. Nozzle or mouthpiece — serves to accelerate the jet of type metal and focus its location to properly enter the mould. Mis-adjusted or off-center nozzles make type that is porous or that has a poor printing face. Mould — creates the body of the type or slug. Most are easily changed to accommodate different point sizes. In the case of the Ludlow, type is typically cast on a fixed point size body. Linotypes and Intertypes utilized a system of liners to match type and mould size. On machines that cast individual type the mould is changed or modified to cast different point sizes. Matrix — creates the face of the type. The “depth of drive” or depth of the recess, must match the mould being used to create the correct type high dimension. Depth of drive varies with the style of the matrix and from country to country. There are three ways to create a matrix. Originally, matrices were made using hand cut steel punches to create the recess that receives the type metal. The next innovation was the use of electroforming to create the matrix. This requires a “pattern type” to be copied. This pattern type could either be an existing type or it could be a new design cut in typemetal. Many of the matrices of the 19th century were made by hand cutting and electroforming in this way. The development of sufficiently accurate pantographs in the 1880s allowed the mechanization of punch and pattern type cutting and also allowed the direct routing of matrices. 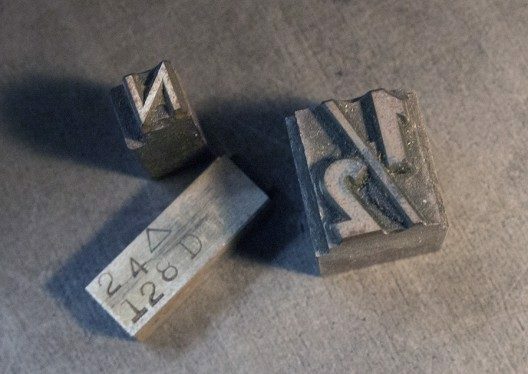 The first directly routed matrices in America were cut in 1882 at the Central Type Foundry in St. Louis. In the 1880s and 1890s, several independent matrix cutting firms emerged. 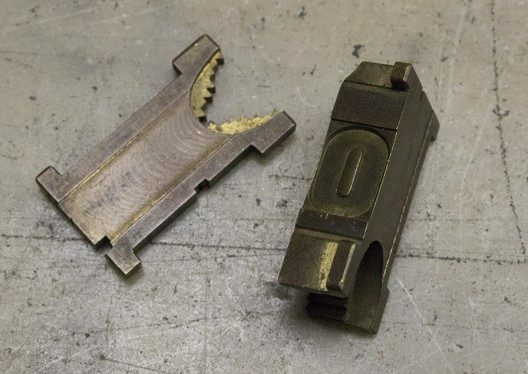 Also in the 1880s, Linn Boyd Benton developed an unusually sophisticated pantograph for engraving pattern types and punches which was leased to several matrix and casting machine companies, including both Linotype and Lanston Monotype. 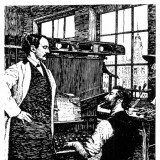 In 1899, he revised this machine for the direct engraving of matrices, though for high production volume matrixes, such as for the Linotype, stamping was still the preferred method of manufacture. While often referred to as “lead type,” type is, in fact, a variable alloy of 54-86% lead, 11-28% antimony and 3-18% tin. Antimony hardens the metal. Tin toughens the metal, counteracting the brittleness of antimony, as well as increasing the fluidity of the molten metal. The exact alloy chosen is based on the type of machine it is to be used in. As the antimony and tin increase in the type metal, the hardness and durability of the type also increases. The downside of this is that the casting temperatures also have to increase to keep the alloying elements in solution. Alloys with the lowest percentage of antimony and tin are used in non-water cooled linecasters, which run at the lowest pot temperatures. The alloys with the highest proportions of alloying elements are used in traditional foundry type, cast with high temperature and pressure sorts casters such as the Barth Typecaster. Even the highest casting temperatures are well below the ‘boiling’ point of lead, thus molten type metal does not produce lead fumes — a detail often misunderstood by the public. Cost, Patricia A., The Bentons: How an American Father and Son Changed the Printing Industry. Rochester: Cary Graphic Arts Press, 2011. Fry’s Metal Foundries Ltd., Printing Metals. London: Fry’s Metal Foundries Ltd., 1956. Southall, Richard, Printer’s type in the twentieth century: Manufacturing and design methods. London/New Castle: The British Library/Oak Knoll Press, 2005.